How many images of Stacy Keibler will be posted this week? Who cares, the more the better! Well, now that we know which team plays for which team, let's get started, shall we?! Ah, yeah that last image pretty much sums up the way we beat down Pittsburgh last year to open the season. It explains how Pittsburgh's season went in comparison to the Ravens' season last year (we won the Superbowl, for those who don't know), and it also explains their season this year! Now let's get down to recent news, shall we? The Steelers, in a great attempt to match our majestic trade for Eugene Monroe, traded for Arizona LT Levi Brown. WOW, what a trade that turned out to be for them! Oh wait, not really. So what does that mean? The Steelers will be starting either Mike Adams or Kelvin Beachem at LT and starting Marcus Gilbert at RT? Against Suggs, Dumervil and Upshaw? How do you feel about that, Sizzle?! I know man, me too! It's gonna be great! 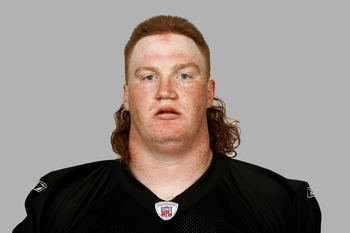 Phew, all these GIF's and pictures are tiring me out, and not one mention of Roethlisberger in a bathroom stall yet! Whoops, nevermind. Let's break down this game shall we? - If you're a female and entering a bathroom that says "Private" and the lights are turned off. 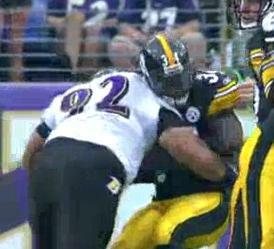 You may want to watch for Ben Roethlisberger hiding in the corner with a chloroform rag. - If you're Ben Roethlisberger on the field, you may want to watch for Terrell Suggs and Elvis Dumervil, who have a combined 12 sacks. That's 3 times more than the ENTIRE Pittsburgh team! Wow. - If you're a Ravens or Steelers fan, you may want to watch for Torrey Smith vs. Ike Taylor. Torrey Smith was 2nd in the AFC in receiving yards until last week, when Joe Flacco forgot that he existed, and he's facing a very solid corner in Ike Taylor who will most likely be shadowing him all day. - Lastly, if you're a Ravens fan, you may want to watch for Stacy Keibler pics to be put up in the GDT. Seriously, why would you want to miss seeing one of the hottest girls on the planet in a bikini? On paper we should destroy them. Our front seven against their OL looks like a complete mismatch. Their defense doesn't force turnovers. But it's the Steelers. It's Roethlisberger. So I'll say it'll probably be close. First one I've ever created. You guys think we'll see ryan jensen this week? he was a limited participant in practice. can't be worse than gino right? No. Harbs already said he's a developmental, backup type player. I think if anything we'll see more AQ Shipley. Another exciting addition will eventually be the return of Jameel McClain now that he's 100% after his spinal cord injury. I think he's a definite upgrade over Josh Bynes, so we will definitely have ILB controversy between McClain, Bynes, and Arthur Brown who hasn't looked too bad either. Looking forward to watching that as well. We spent a valuable roster spot on him when we could have easily IR'd him. Obviously not this week, but we could be seeing him in a bigger role later this season. Ryan Jensen is the creepiest looking dood of all time. We NEED to eliminate those 30 yard downfield pass off of a Ben scramble for TDs that ALWAYS seem to be the difference in our close games with them. If we limit the big plays, we should have a great chance at going into the bye with a 4-3 record, ready to win a 3rd division game @CLE in two weeks. Let the record show that fans of a team with Tom Brady is making fun of someone else for being a whiner. Steelers 16 Ravens 12. Steelers with 8 safeties and Ravens with only 6. Gradkowski will be responsible for 4 of them. Still 50x better than McQuistan..
That's the weirdest attempt at a beard I've ever seen.